Here at Knox Carpets, picking our favorite style of flooring is often like picking a favorite child. We hem and we haw, we know that ethically this is a frowned upon ritual. We feel a little bit naughty and we feel very torn because they’re all so different and special. In part, it’s to keep the peace. Because the Knox Carpets team is impassioned about our purpose and industry, and each team member is passionate about their particular skillset and bank of knowledge. How else do you think that we remain on the cutting edge of the different process and material innovations in the industry? We attend the industry events, we read the industry literature, and then we have incredibly spirited discussions about which products can make it into our selective arsenal. We’ve regaled you time and time again with the different criteria, the different boxes that must be checked. Price? Low. Durability? Forever. Aesthetic? Classic and on trend. Customer satisfaction? The highest of high. Were we to pick just one favorite style, none of the above would be possible. So instead of picking just one favorite above the others, we’d much rather shine different spotlights on each respective style that we represent. Deep down, we’re pretty sure that most parents of multiple children would heave a sigh of relief as soon as this option was presented their way. Today’s spotlight shines brightly on laminate. Our laminate flooring was inspired by the beauty of wood. We feature products from Heartridge, which will make you feel at ease in your space, as you recharge and relax with your loved ones. Our range of laminate flooring options each has a real wood look and feel. Authenticity at its finest. Even to the most critical of eyes, it’s difficult to discern which is which. That is, until you take a look at the price tag. 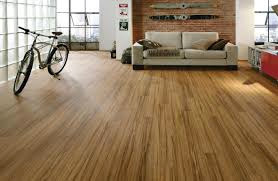 Laminate is wood flooring without the high price tag. This means that you can add the sought after character and warmth of wood to your home and keep you wallet in check, at the same time. Our range of laminate flooring, designed by Heartridge, is detailed with an embossed finish so you can truly feel the grain of the timber pattern. We told you, the real deal! We’ve also probably told you, we take the miniscule details very seriously. You can explore the mirco bevel edging. You can explore the patterns, never repeated on any plank. You can ensure your flooring will have the unmistakable character of genuine timber. Enough about its visual beauty. Our laminate flooring options are built for durability with an AC4 rating. You can rest assured knowing that our flooring is strong enough for commercial applications, so it doesn’t matter if you’re installing for your home or your next business venture. Let’s redirect your worry, because you can ensure that any laminate flooring solutions from Knox Carpets will be just as beautiful today as they will be for many decades to come.